To celebrate the feast of St. Cecilia, local musicians play all types of music in church of St. Felipe de Nero (the Oratorio) the afternoon of November 22nd. Cecilia is one of the Church’s earliest saints and is the patroness of musicians. Consequently, in art, she is featured with a musical instrument. Cecilia gained this honor by singing at her own wedding in Rome during the second century. Her voice was remembered as so strong and graceful, that music became her identification following her martyrdom. Cecilia gained renewed interest in the Middle Ages when her body was exhumed in Rome and was labeled incorruptible. Her tomb is a frequent pilgrimage sight for musicians and her popularity continues strong here in San Miguel and among musicians worldwide. 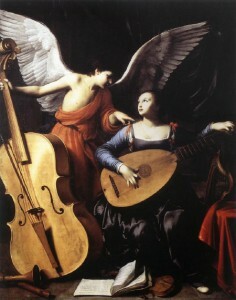 St. Cecilia is mentioned by name in songs by contemporary popular artists like David Byrne and Paul Simon. Also it is common for San Miguel’s musical parents to name their daughter Cecilia.